In 1976, then Runai of the club Jimmy Ryan, endeavoured to put together a history of Kilbrittain GAA club from 1904 up to 1976. He produced the first written history of the club 'A Club and A Tradition'. In 2001, a committee headed by Barry O'Sullivan and Sean Quinan, was set up to record the history of Kilbrittain GAA club to coincide with the Centenary of the club in November 2004. The book 'Kilbrittain GAA 1904-2004 Our Gods and Our Heroes' was finally finished during 2005. The following history is primarily based on the information gathered for and printed in both publications. O'Connell raises the county trophy after winning the Intermediate hurling county in 1995. 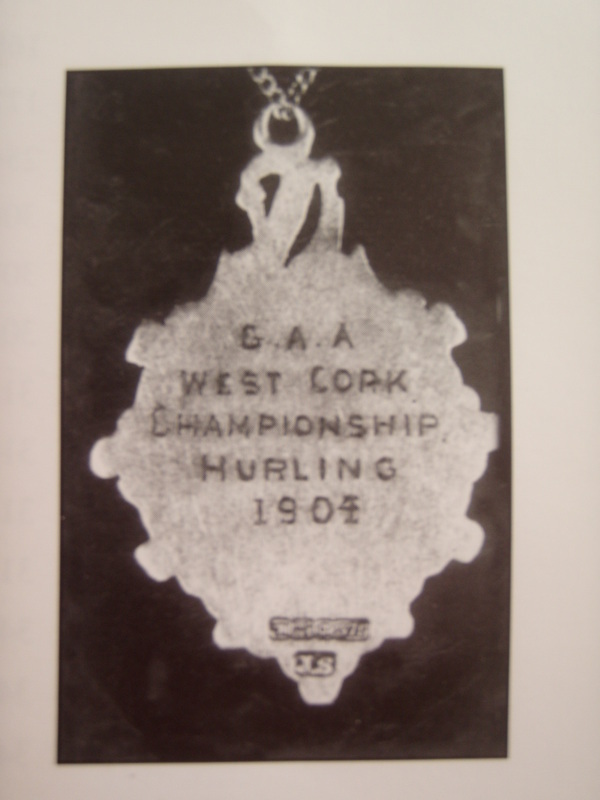 Medal on left is first medal won by a member of the club for West Cork Junior A hurling championship in 1904. Medal on right is most recent West Cork medal at time of book publication. U21 A hurling West Cork 2004. Timoleague, to the west and Courceys parish to the east. With the atlantic ocean to the south!. While the GAA club was officially formed in november 1904, hurling and football were played in the area in earlier years and there are references to games played in the area long before the formation of the club.The following poem was published in 'The Southern Star' in the 1930's prior to a hurling match between Kilbrittain and Bandon. around the mid 1800's, long before the founding of the GAA. And the hurlers long ago. When the caman plied the ball. And the peerless James O'Hea. To the thunders of "well done"! When the game was once begun. Champions of the Rebel County! Victors in the swinging fray! Of the men of yesterday. Are fast coming to the fore. 'Fagh a Ballagh', boys again. There is written evidence of a football game between 'Spittle' and 'Maryborough' at Timoleague. A report of the game appears in 'The Southern Star' on the 25th June 1893. Maryborough won the tournament match 1-1 to 0-1. On 24th February 1901 a report of another football game is seen. 'Harbour view' beat 'Barleyfield'. The game was played on the grounds of Mr McCarthy of Harbour view. It is presumed that hurling was also played within the parish at this time despite most reports being that of football games as no hurling reports can be found. Despite the lack of hurling reports, these documents proved that the young of the parish were actively playing Gaelic Games before the official formation of the club in November 1904. Hurling indeed was played all over West Cork with stories in folklore of great hurling matches hundreds of years ago. Parish versus parish with hurling being played in preference to the old football game of 'caid'. when the Gaelic Athletic Association finally arrived in West Cork in 1886-87, hurling it seems had been completely abandoned and the new game of Gaelic football became the game played between all newly formed clubs of the time. Between 1887 and 1905 there was no hurling match played in West Cork and no West Cork team entered the county championships. Due to communication difficulties with the county board, a new West Cork committee was set up in January 1904 to run GAA matters in the area from Kinsale to Bantry. They organised the first official West Cork football championship in 1904. More importantly, they decided to introduce a hurling championship in 1905, the first ever hurling championship to be played in West Cork. The Kilbrittain GAA club was founded in the latter months of 1904 under the guidance of then curate Fr. Dan O'Donovan. Fr. O'Donovan, a native of Ardfield/Rathbarry, was ordained in April 1897. He became curate of Kilbrittain in September 1902 until October 1908 when he was appointed to Ballincollig. Along with Fr O'Donovan, the mentors were Paul Lennord, Mike Sheehan, Jerome Deasy and Danny Ryan. They played their first club hurling challenge game against Bandon in Bandon on St Stephens day. It was played at O'Mahonys field, Castle Road. Kilbrittain were declared the winners scoring three points to Bandon's one. The lowly status of hurling around this time can be seen in the following comments which followed the report of the game. "It is hoped that such a good exhibition of hurling as was thus displayed by two absolutely new teams will encourage a more general revival of this fine manly pastime." Unfortunately the new hurling teams bar one, were all situated towards the eastern side of the Barony. Established football clubs Bandon, Clonakilty and Skibereen Rossas, the only western team, took to hurling immediately, and new clubs like kilbrittain, Ballinadee, Clogagh and Shannonvale were formed specially for the new hurling championship. The first championship draw was: Shannonvale v Clogagh, Bandon v Ballinadee, Skibereen v Clonakilty, Kilbrittain a bye. There is no record of the Sannonvale/Clogagh game on 23rd April. bandon beat Ballinadee, Rossas beat Clon. In the semi-finals, Rossas beat Bandon and a Bandon objection was over-ruled. Kilbrittain beat Clogagh. The first ever West Cork hurling final was played in Clonakilty's new Town Park on 13th august with Kilbrittain emerging winners by 4-10 to 2-05 in a great game. Inaugural champions, Kilbrittain's joy was short lived as Bandon had appealed their objection to County Board who upheld the appeal and ordered the final to be replayed between Bandon and Kilbrittain. The West Cork committee refused to accept the County Board decision and declared Kilbrittain as official champions and presented them with a set of medals. Kilbrittain were deprived of a place in the county championship and it was Bandon who went on to lose 5-13 to 0-2 to Castletownroche. 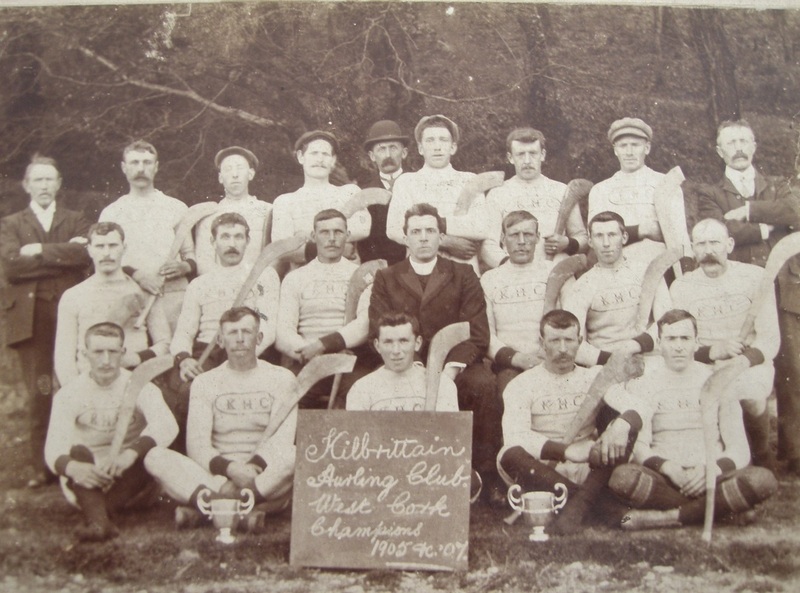 Kilbrittain are still accepted as the first official champions of West Cork in 1905. In November 1905, the club were presented with a beautiful silver cup by the Alcock Stawell-Riversdale family. The following report appeared in the 'Southern Star' in the same month. The Kilbrittain hurling club in connection with their winning of the West Cork Championship of 1905, and for which they are to be presented with a set of medals by the West Cork committee, have recently been the recipients of a very handsome trophy from Mr. W.Alcock Stawell-Riversdale, of Kilbrittain castle. From the inception of the club in November 1904, Mr. Riversdale has taken a very keen interest in its welfare. He has given freely and voluntarily practice and match grounds which could not be excelled by any grounds in West Cork. He has been at pains to encourage the members of the club by the many means which a gentleman of his position demands, and not content with all this when the Kilbrittain team were declared winners of the West Cork Championship, he decided to present the club with a silver cup to commemorate their victory. "Presented by W.Alcock Stawell-Riversdale Esq., to the Kilbrittain Hurling Club as a proof of his satisfaction at thier having won the West Cork Championship of 1905"
Now that such a general effort is being made for the revival of our Irish games, the enthusiasm and support of a gentleman like Mr. Riversdale is highly gratifying. His action and that of Mrs. Riversdale, whose name is synonymous with initiative and plucky enterprise, reflects great credit on them, and must win for them the deep respect and affections of the people amongst whom they live. Kilbrittian were the only team from the 'West' division in the County Board hurling draw for 1906 as Bandon and other south-east teams were in the 'South' division. Kilbrittain reached the final of the West Cork again in 1906 where they met Knockavilla in the final played in Clonakilty. Knockavilla were victorious on a 6-08 to 2-05 scoreline. Reports from 1907 and 1908 are sketchy. It appears that Kilbrittain were again the only team from the 'West' division in the County Board draws. In West Cork, they were drawn against Rosscarbery in the first round and progressed to meet Clogagh in the final. A dispute arose between the teams as to where the game would be played. The row went to the County Board who suggested Cork as a venue for the game in May 1908. We do not know if the game was ever played, but Kilbrittain were declared champions and were again presented with a silver cup by the Alcock Stawell-Riversdale family of Kilbrittain castle. "Presented by Mrs. C.Alcock Stawell Riversdale to the members of the Kilbrittain Hurling club to commemorate their aquisition through their first and second teams of the premier honours of the hurling clubs of West Cork in 1907"
Kilbrittain Community Grounds "GAA Pitch"
Very first medal for the inaugural West Cork Championhsip. 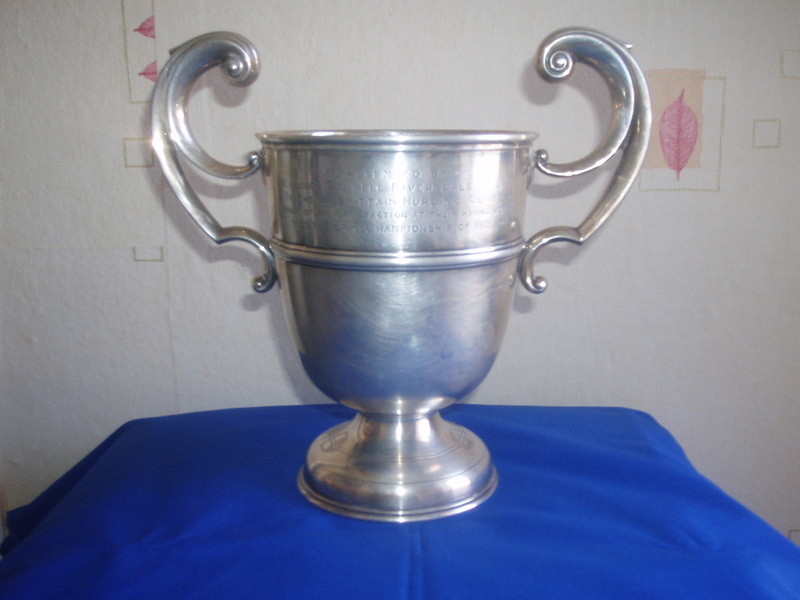 Silver cup presented to the Kilbrittain hurling club by Mr. W.Alcock Stawell-Riversdale Esq. after winning the West Cork championship in 1905. Front row l.to r. : Jer Ahern, Tadhg O'Driscoll, Paddy Ahern, Dan O'Mahony (capt), Mick Long. Middle row l.to r. : Brian O'Driscoll, Sonny Hallissey, Dan Healy, Fr. Dan O'Donovan, Jer Healy, Jim Ahern, John McCarthy. Back row l.to r. : Mike Sheehan, Jim O'Sullivan, Charley Russell, John Hallissey, Jerome Deasy, Dan Brown, Jack Ahern, Patsy Brown. Danny Ryan. There are no match reports involving Kilbrittain found for 1908 as the dispute from 1907 lingered on for most of 1908. In any case the west Cork final of 1908 was played in October in the town park Skibbereen between Clonakilty and Innishannon. Clonakilty failed to turn up and Innishannon were awarded the title. In 1909 a league was started in South West Cork with Kinsale, Bandon, Ballinhassig, Innishannon and Kilbrittain taking part. Kilbrittain were beaten by Bandon in the West Cork semi-final in Skibereen in July. The Intermediate grade was first introduced in hurling and football in this year. 1909 was also the year that Ratharoon native J.J.Walsh took up his position as President (later to be known as Chairman) of the Cork County Board. "that the GAA might be brought into line as a practical instrument of the advancement of the Irish language, Irish Industrial development, the spreading of temperance and that the necessary steps to this end be taken forthwith"
Ratharoon native J.J.Walsh with Countess Markievicz. His proposal was passed. He made improvements in Cork GAA such as the erection of turnstiles on the principle pitches, organisation of leagues, auditing of accounts and contact with the railway companies to streamline travel to matches. He attended Central Council meetings where he was very influential. In January 1914 he was elected an Alderman of Cork Corporation after standing as an independent candidate. He resigned from the Cork County Board in November 1914 and his active connection with the board came to an end due to his political activities. He was given the option of a transfer in his job to Bradford or else be deported. He was a post office official at the time he went to Bradford but did not last long. As an Alderman of Cork Corporation, he received news of a proposal to confirm the freedom of Cork on the new British Viceroy . He issued a statement rejecting the idea in no uncertain terms and was deported. Intending to return to Cork, he was arrested in Mallow and told he would not be allowed return. He went to live in Dublin where he carried on a tobacconist business by day and his volunteer activities by night. His letter of resignation from the County Board was not accepted and he was retained in a nominal capacity for a number of years. At the next convention he was appointed honourary President, whilst the title of President was changed to Chairman. An active volunteer he fought in the GPO in 1916 and was elected an M.P. for Cork in 1918 and remained an M.P. and T.D. until 1927 when he did not seek re-election. He became Postmaster General and Minister for Posts and Telegraphs in 1922 as a member of the first Free-State Government. On becoming a member of the Government he continued to attend GAA Central Council meetings in an unofficial capacity and was an important link between the Government and the GAA that was growing from strenght to strenght. He concentrated on business after 1927 and was successful in that area also. He died in 1948 and is buried in Cork. From stories told, Fr. Dan O'Donovan was a strict trainer with drinking, smoking and late nights not looked kindly on! While his methods of training were harsh, they were fruitful. His three commands, "No Smoking, No Drinking and early to bed" were well received. He was loved and respected by players and parishoners alike and it is said he produced as fit a team as some present day inter-county squads. The main hurling field was John Cummins's field in Clashavanna about a half a mile north of Kilbrittain village. One member of the Cummins family William, a school teacher by profession was also a member of the state's first Senate between 1923 and 1936 representing the Labour Party. He died in 1943 and is buried in Kilbrittain. There were other fields around the parish where people would gather to play hurling and football but these were not used for official matches. Some of these fields were in Granasig, Ballycatten, Burrane, Burren, Crois Na Leanabh and Harbour View. The Club colours in those early days was a white jersey with initials K.H.C. engraved on the chest. Hurley's were made by the players themselves or by some individual with a knowledge of the trade, such as Jim Ahern. It is important to mention that in the early years, the team was selected on sheer strength alone and no young player, no matter how skillfull he may be, would be considered for a place. It is true to say that not alone would he not be considered, but they were also barred from training with the older and more robust players. However young players were not neglected, as even in those early times, Fr. Dan O'Donovan realised the importance of young players and organised and coached a second string to insure a plentiful supply of talent in the club. On one occasion Fr. O'Donovan organised a challenge game between the first and second teams and it is said that the youngsters won handsomely. However a second game was arranged and on this occasion the older players used their strength and experience to the full and came out winners. This game must have been a real battle, as immediately afterwards, the club split in two sections with the older players continuing training on their own, while the younger men organised themselves and commenced training in Miah Coughlan's field in Ballymore. This situation did not prevail for long as Fr. O'Donovan soon had things back under control again and from this time onwards, the emphasis was on youth and skill rather than solely physical power as heretofore! In 1911 a meeting was held in April in Bandon to set up a South Cork football and hurling league. Mr.D.Hallissey representing Kilbrittain felt that Kilbrittain would enter a football team. However there is no record of Kilbrittain entering a football team afterwards. On Sunday 10th March 1912, a meeting of West Cork gaels was held at Roches, New Road Bandon. It was addressed by Mr J.J.Walsh, chairman of the County Board. Kilbrittain were represented by Patrick Aherne. Mr Walsh outlined that from now on would administer the affairs of the West Cork board and run their championships direct from County board level. It was decided to introduce Intermediate and Middle grades for the first time. In hurling Kilbrittain were classified as Middle Grade along with Kinsale, Bandon, Clonakjilty, Skibereen, Ballinhassig, Ballymartle and Dunmanway. Kilbrittain went on to contest the final where they were beaten by Clonakilty. The same pairing made the final in 1913 where the result was reversed. Kilbrittain won 7-01 to 4-0. Kilbrittain were beaten by a strong Shanballymore side in the County Championship on 25th October.
" A player from each team was ordered off the field, they beat one another with hurley's. Several players were injured on both sides. The teams played very wild and cross, with several of the players losing their tempers. It nearly finished in a pitch battle with hurleys." The Board called for a twelve month suspension on both teams. But a member thought the temper of the teams was tried very much by having to wait a half an hour on the pitch for the referee and he thought the referee should be suspended first. Eventually both players sent off were suspended for six months and the referee was written to for an explanation on his late arrival. While reports could not be found for 1915, Kilbrittain were beaten by Knockavilla who reached the Div. 111 county final where they were defeated by Carrigtwohill. The following year, Kilbrittain reversed the 1915 result and beat Knockavilla in the final. They were beaten by Cove (Cobh) in the county semi-final which was played in March 1917. Accounts of games at this time are few possibly due to failure of fixtures being fullfilled due to the 'troubles' of these years. While the GAA was still active, the majority of clubs especially clubs like Kilbrittain, where volunteers were active, did not take part. Many were to take up arms in the struggle for freedom, some never to return. It was because of this background in these turbulent times that the club and its activities finally ceased to operate before reforming again in late 1922. This chapter of our early years will always be remembered for the fact that never again was the colour white, with the initials K.H.C. to be worn by Kilbrittain teams. The colours which herald the birth of our great club.